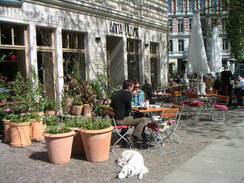 Voted by BertaBerlin here are the top 5 places to drink your coffee in Prenzlauer Berg. If you want to find more hidden gems of the German capital, pick a BertaBerlin map for Prenzlauer Berg in my shop. Better than the naughtiest milkshake! Whether you like it tropical and fruity, super green or with peanut butter or tahini – the heavenly superfood smoothies here won’t leave you disappointed. A stone’s throw from the famous Mauerpark Sunday flea market, a quick pit stop at The Juicery Berlin will fuel you up for the day. 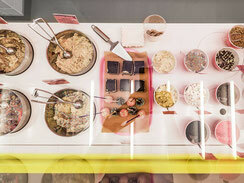 This shop is painted in bubblegum pink and has only one thing on the menu: cookie dough from sprinkles to candy and chocolate with a lovely selection of toppings. This café, named after a poem by German poet Kurt Schwitters, offers culinary and floral specialties since 2005. 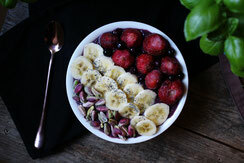 The fragrant coffee and tea specialities, the homemade gateaux and cakes and the freshly prepared food transform every breakfast in an entire experience. 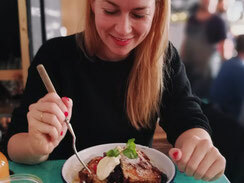 This café is run by the super friendly Frenchman, Allan, who is offering delicious Aussie-style breakfast platters and classics like Eggs Benedict and Croque Monsieur combined with quinoa salad. Prepare yourself for all the happy vibes, colorful coziness and flavor explosions! 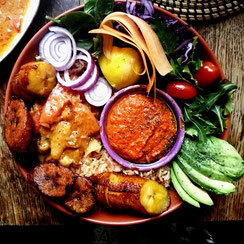 The unique combo of Senegalese and Italian vegan foods that are grounded in the origin of the owners - home cooked meals you won’t get anywhere else and that you will surely crave when you’re gone.